The best in-wall safe is the ideal storage solution if your want to hide you valuables or firearms. Not only is it a pretty cool hiding spot, just like the movies, but it’s also very effective. To help you out, we have gathered the best in-wall safes for your home and for guns and compiled it into one big review guide! 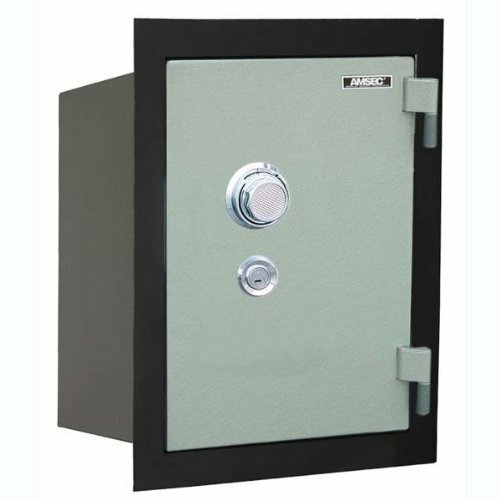 Paragon is a manufacturer that has produced many in-wall safes over the years. Today, in 2017, they got three in-wall safes that they are promoting. The Paragon 7700, 7750, and 7725. What you will find out in the comparison table below is that they are extremely similar. However, they have different dimensions and a slightly different design to one another. You should have no problem installing these in-wall safe if you have standard wall studs with a spacing of 16″ OC. As you can see, these Paragon in-wall safes feature more or less the same things. The Paragon 7700, however, is flatter, which makes it perfect to conceal behind a painting or a mirror. The Paragon 7750 and the 7725, on the other hand, have a console that sticks out about .5″, which makes it better for closets. You may experience difficulty installing this in-wall safe if you have standard wall studs with a spacing of 16″ OC. 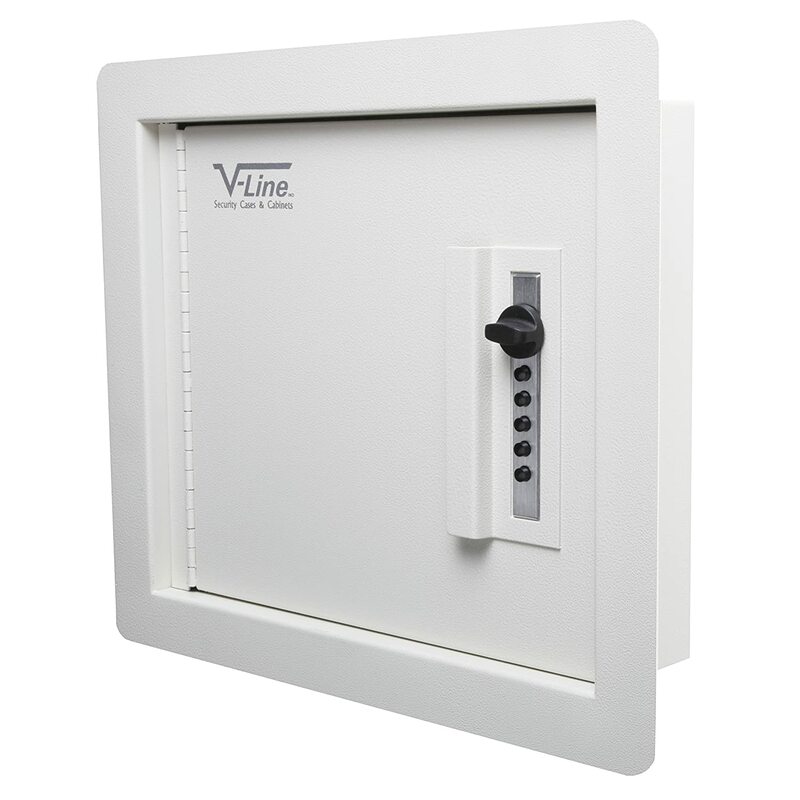 Yescom offers a fantastic and slightly cheaper alternative to the Paragon in-wall safes. It may offer less space, BUT the door is made of 7 gauge thick steel in comparison to Paragon’s 11 gauge. Why is this important? Well, most burglars attack the door with various prying tools. The thicker steel door you have, the better security against these type of attacks you will have. The door is also recessed with internal hinges and reinforced by two steel locking bolts. Breaking into this safe with prying tools will be a difficult task for the common burglar. What if someone tries to brute-force your password? Don’t worry, the electronic lock on this Yescom in-wall safe will block access after 3 incorrect password attempts. Last but not least, you will get two backup keys, mounting hardware, and a manual. You should have no problem installing this in-wall safe if you have standard wall studs with a spacing of 16″ OC. Next up, we have the Giantex Electronic Wall Hidden Safe Security Box. What’s nice about this in-wall safe is that it has a 9 gauge thick steel door. In conjunction with the two steel locking bolts and the internal hinges, it offers a solid defense against pry attacks. The locking mechanism consists of a simple electronic lock with a numeric keypad and a turning knob. It also has a neat security feature that will prevent access after 3 incorrect attempts. Just like the Paragon in-wall safes, it offers an interior space of .83 cubic feet. The interior is also equipped with two shelves and a bottom carpet. Additionally, you will get 2 backup keys, mounting hardware, batteries, and instructions. The home in-wall safes are great but they are more appropriate for household stuff. If you want to store a gun or something a little bit more dangerous, you need something more secure. Unless you want your gun in someone else’s hands that is. 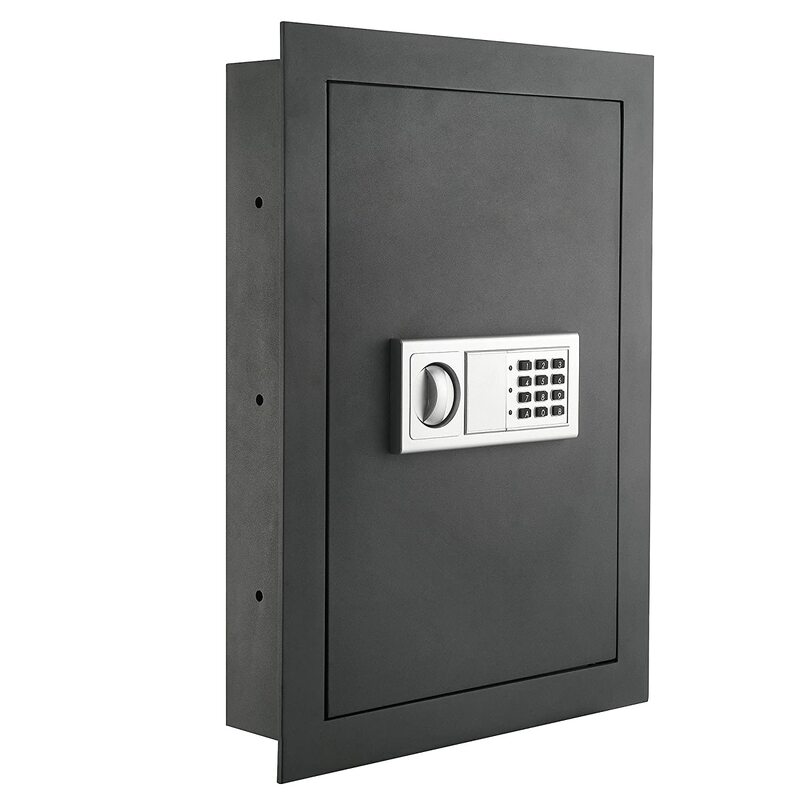 The AMSEC WFS149 Wall Safe is exactly what you need if you are looking for an in-wall gun safe. With a massive 1/2″ gauge steel door and two 1/2″ steel locking bolts, it’s virtually impossible to drill or pry into. Additionally, it has a U.L. listed group II combination lock and 60-minute U.L. certified fire protection(!). The interior is extra deep for more space and is equipped with a drawer shelf. The total interior space is 0.73 cubic feet. Next up, we the V-Line Quick Vault Locking Storage for Guns and Valuables. 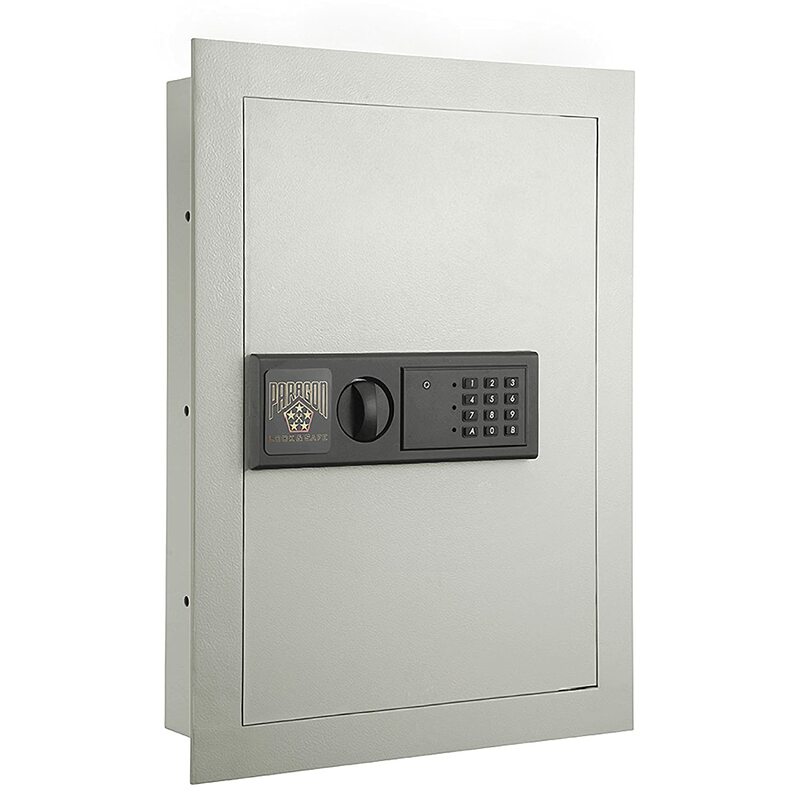 This in-wall safe put an emphasis on security without compromising on quick and easy access. For a starter, it has a 3/8″ gauge thick, recessed steel door, reinforced with anti-pry brackets. 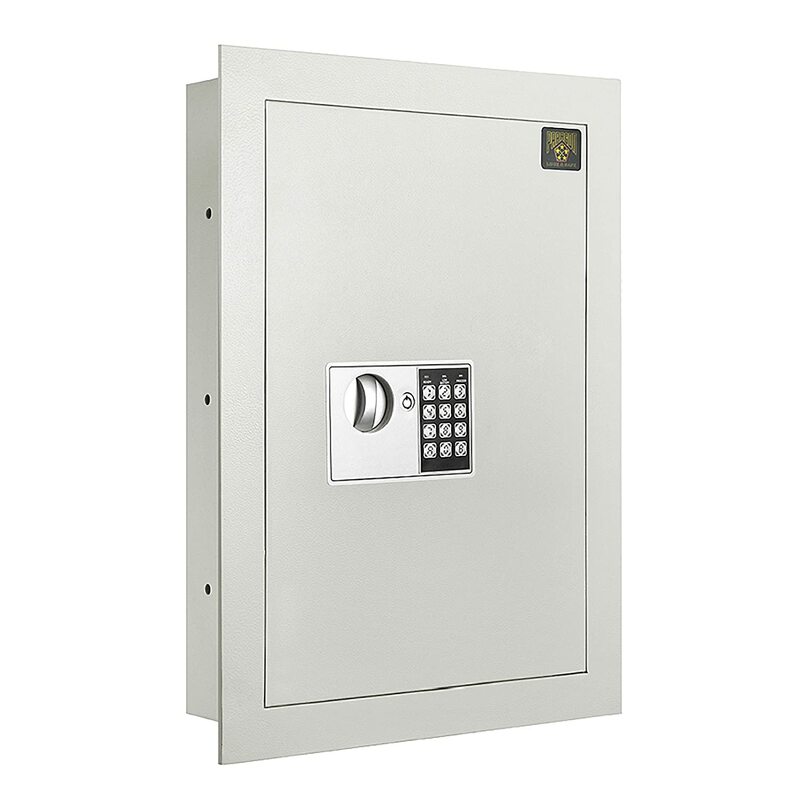 This is a fairly small but compact in-wall safe with an interior space of 0.19 cubic feet. However, most of this space is available due to the SIMPLEX push button lock. 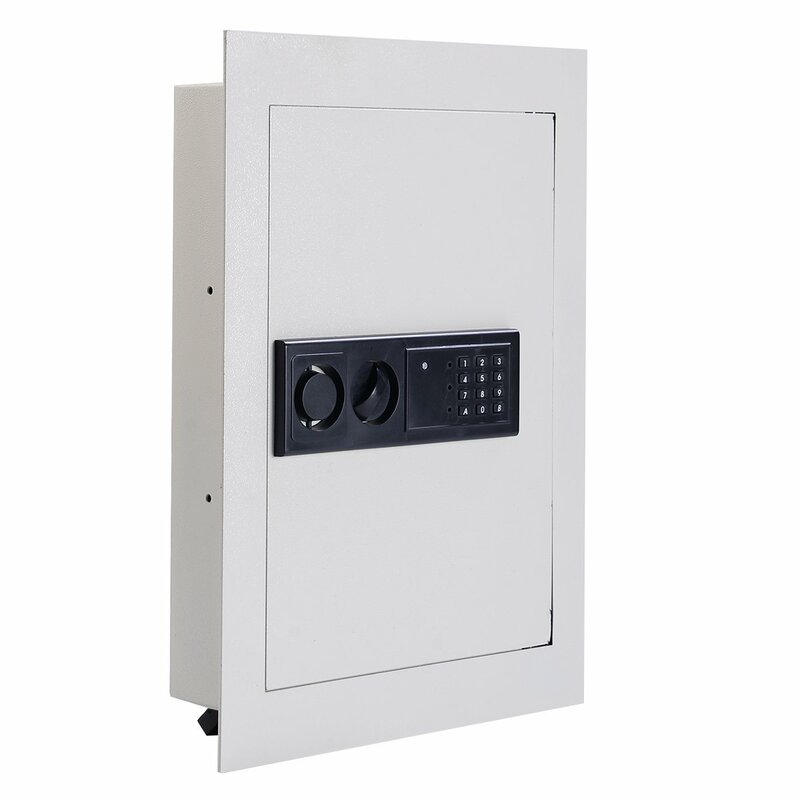 Unlike in-wall safes that has an electronic lock that consumes up to 1/3 of the interior. The SIMPLEX push button lock is mechanical and doesn’t need any batteries. It has five buttons which give you 1081 combinations to choose from. Additionally, it has pre-drilled holes, carpeted interior, and a nice powder coating. 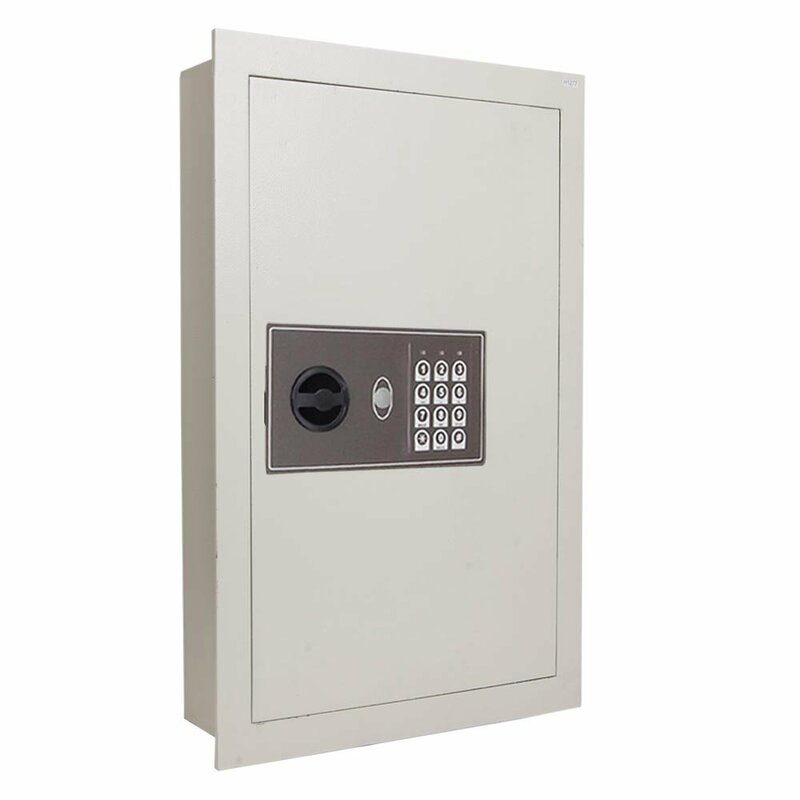 Last but not least, we have the Viking Security Safe VS-52BL Biometric Fingerprint Hidden Wall Safe. The only biometric in-wall safe in this guide. So, what can we say about this feature-rich in-wall safe? First of all, if you want quick and easy access without remembering a code — this is the best wall gun safe for you. 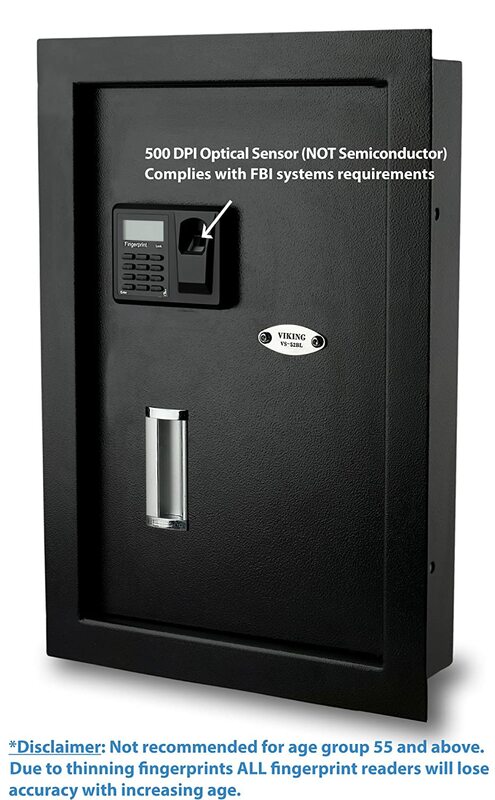 The biometrics of this in-wall safe is outstanding and approved by F.B.I. However, if you like to remember a code there is an electronic keypad lock as well. And don’t feel discouraged if you like keys because you will also find a key lock. If you want to know more about the features, check out our Viking Security Safes — Ultimate Guide 2017 post. Security wise, it’s not quite as thick as the AMSEC or the V-Line in-wall safe. But, it’s still very capable of keeping your guns safe with its 14 gauge steel body and the 7 gauge steel door. The door is also recessed and reinforced by two steel locking bolts for great pry resistance. When it comes to the interior space it’s right in between the AMSEC and the V-line in-wall safe. With 0.52 cubic feet you will have no problem to fit a handgun or two with ammunition. The interior also features a key hanger and a carpet. If there is one thing you should take away from this article, it’s to plan before you buy. This is especially important if you are buying an in-wall safe. Before you buy an in-wall safe, look up how your walls are structured and the spacing between the studs. When you have done that, the installation process will be much easier. If you are only looking to store cash, jewelry, cameras, important documents, etc — the best in-wall home safe will do. If you are looking to store guns — go with the best in-wall gun safe!